Some rains helped with the top foot profile at some of these locations last week. One thing to keep in mind when viewing these graphs is we don’t always know what’s going on below the soil surface. One farmer had a good point regarding my “blips in the graphs” in my last blog post. I mentioned they could be due to a soil crack along the PVC pipe-which we do see occur and can be true. However, he also had a good point that it could be a worm hole, root channel, etc. that water may have followed for a brief time period, which could also be true, especially in these long-term no-till fields. As you look at the charts this week, it’s important to keep in mind that soil water also moves via gravity (termed ‘gravitational water’). Thus, sometimes why we can see changes in soil moisture in the successive drier layer with small amounts of precipitation. Nebraska Drought Monitor as of 4/26/18 showing increasing ‘abnormally dry’ areas of the State. The ‘moderate drought’ area has expanded further into Webster and Thayer counties. Stars show locations where I’m taking pre-plant soil moisture status. Beginning soil moisture at Bladen remained relatively unchanged last week. The top foot went back to around field capacity with some rain events. Total soil moisture depletion is above 50% at this site as are all soil layers from 2′-4′). Moisture last week did appear to re-wet the top 2 feet. I even probed the soil in the same area to ensure there was truly moisture in the second foot, which there was. Yet as you can see from the graph, the second foot was starting to climb when I took these readings. My guess is without additional precip, the second foot will be above field capacity again next week. Because the top two feet were already around field capacity, gravitational water along with moisture received last week may have created the dip in the third foot readings seen over a few days. It was rising back up to above 50% completion on 4/26. The sensors were removed on 4/26 as the field was planted to soybean that day. This location received 0.20″ of rain last week with essentially no change in soil moisture status from the previous week. Total soil moisture (1-4′) is steady around 35% depletion. This location also received around 0.20″ of rain last week. Something happened to create a short in the top foot sensor, thus, the lack of data for 1′ and total (1-3′) after 4/22. It was fixed on 4/26. This location received around 0.60″ of rain last week. The top foot remained steady and there was a gradual decrease followed by increase in soil moisture in the second foot. This would make sense from the combination of gravitational water and the precipitation moving through the first foot into the second, but the moisture wasn’t enough to maintain the second foot at a wetter moisture level. Crop Update: It’s nice to see some signs of spring with planters going this week/weekend, crabapples and flowering pear trees in bloom, and tulips budded! The York County Corn Grower plot got planted on Saturday and grateful for Ron and Brad Makovicka’s efforts with that and for all our participating companies! Rain did help the top foot of sensors in some locations I’ve been monitoring for pre-plant soil moisture. The graphs will be up at http://jenreesources.com by noon on Monday. The cooperators have all been interested in continuing to monitor moisture in these fields post-planting, so will plan to do that and add a York and Seward location too. I’m noticing in York as lawns are greening up, that portions are looking gray-green in color where trees are located in them. As of April 26th, I hadn’t found any wheat jointing yet. The growing point was just approaching ground level in several fields I checked. We also need to keep an eye out for stripe rust as incidence is increasing in Kansas fields. There’s articles focusing on winter wheat in this week’s UNL CropWatch at http://cropwatch.unl.edu including nitrogen management and Nebraska wheat progress. Wheat Stem Maggots (WSM) in Rye/Wheat Cover Crops: I meant to provide an update in last week’s column. Dr. Justin McMechan has been scouting wheat and rye cover crop fields for wheat stem maggots. So far, he captured one adult wheat stem maggot on April 16 in 100 sweeps from a wheat cover crop planted in late September at the Eastern Nebraska Research and Extension Center near Ithaca. He shared that “adults have been consistently collected at this location since first emergence with one to two found per 100 sweeps. This first occurrence of adults matches closely with data collected in 1933 by Merle Allen from Kansas State University. Our latitude north of Kansas and cold spring suggests this emergence might be earlier than Allen’s data. On April 23 two adults were collected at Clay Center and a single adult was collected near Marquette. Cover crops in these fields were less than 6 inches in height, with the field near Marquette grazed to approximately 3 inches in height. Sweeping these fields is challenging due to the height of the vegetation so adult captures are not likely to represent true numbers in the field. If you are skilled with a sweep net, we encourage you to sweep your wheat, rye, or triticale cover crops for wheat stem maggot adults.” At this point we’re not recommending any insecticide treatments. An interesting observation that a couple of Clay and Adams county farmers mentioned to me last year was they noticed the presence of a lot of flies as they planted corn into green rye and terminated at or after planting corn. The adult WSM is a small fly and you can see photos in Justin’s report in this week’s UNL CropWatch at http://cropwatch.unl.edu. Which dicamba product before Xtend soybean: This has been a fairly common question this spring which Dr. Amit Jhala addressed in this week’s UNL CropWatch. I’ve also provided his answer here. “I recently received several phone calls from growers with questions on terminating broadleaf cover crop species and broadleaf weeds using dicamba products. They were particularly interested in whether dicamba products such as Banvel, Clarity, DiFlexx, etc. can be applied to terminate broadleaf cover crop species such as hairy vetch, field peas, or mixtures and broadleaf weeds such as henbit, field pennycress, or marestail immediately before planting Xtend soybean. The answer for the dicamba-based herbicides listed above is NO. Their labels have soybean planting intervals of 14 to 60 days, depending on the product and its use rates. If DiFlexx is applied burndown at 24 fl oz/acre or less, the planting interval for soybean is 60 days. This longer planting interval must be applied because Xtend soybean is not listed on Banvel, Clarity, DiFlexx, or other dicamba products. Dicamba-resistant soybean, also known as Xtend soybean, became available commercially for the 2017 growing season. Three dicamba products (FeXapan, Engenia, XtendiMax) are labeled to be applied pre-plant, pre-emergence, or post-emergence (up to R1 soybean growth stage) for broadleaf weed control in Xtend soybean. You can use FeXapan, Engenia, or XtendiMax as per label requirements in burndown application and plant Xtend soybean without a planting interval. Here is an update on beginning soil moisture status. The left charts are as of 4/19/18 with the right charts being the previous week. You can click on the images to enlarge them. The ‘weekend moisture’ event I refer to was the blizzard 4/14/18. Bladen: The top foot is now slowly losing moisture one week later in spite of some weekend moisture. The second-fourth feet are all above 50% depletion. Byron: Some weekend moisture may have allowed the top foot to remain steady. The second and third feet are both over 50% depletion bringing the total soil moisture in the 1-4′ depths closer to 50% depletion. There must have been a soil crack along my PVC pipe to allow for the moisture spike you see in 3 and 4 feet and not 1 and 2 foot depths. Clay Center: This is still the wettest location in spite of the top foot slowly drying out this week. The second foot is still below field capacity with third and fourth feet and total soil moisture relatively unchanged. Must have had a soil crack along PVC pipe for third foot for the quick dip observed. Lawrence Corn Stubble: Minimal change was observed at this location this past week. Essentially all feet remained the same in regards to soil moisture. A small crack along PVC pipe must have been present at 3 foot for short dip observed there. Lawrence Soybean Stubble: This location (across road from corn stubble) showing dryer than last week. Top two feet now dryer than field capacity which increased the total (1-3′) soil moisture depletion. Superior: Weekend moisture may have allowed the top foot to stay steady (as was also seen in Byron). However, the second, third, and fourth feet all lost moisture leaving the total soil moisture (1-4′) above 35% depleted at this location. Well, winter seems to be sticking around. My thoughts and prayers have been with those of you calving with the difficult conditions this year. I provided an update regarding soil moisture status in non-irrigated fields both in this week’s UNL CropWatch at cropwatch.unl.edu and my blog at jenreesources.com. We’ll see what happens with moisture in the next few weeks and I’ll post updates to my blog. Very few have tried planting in this part of the State that I know of. Grateful for all of you who keep me updated on what’s going on through your questions and comments! In this week’s UNL CropWatch, Dr. Roger Elmore took the lead on an article addressing corn planting. The message is to ideally wait till soil temperatures reach 50F with weather conditions allowing soil temperatures to remain at 50F or higher for the next 48 hours. We’ve observed when seed was planted and a cold snap with cold rains was received within 48 hours, some problems with seed germination and emergence. Hybrids vary in cold tolerance and seed companies are a great resource for that information as to which hybrids could be planted first in colder soils. Soil temperature information can be found at the UNL CropWatch site at: https://cropwatch.unl.edu/cropwatchsoiltemperature. We’d also recommend you take the soil temperature in the field before you plant and can do so by using a meat thermometer. Last year I remember receiving questions from April 21-24 regarding planting corn and soybeans with an anticipated cold snap later that week. At that time, I was recommending growers switch to soybeans. The reason? Soybeans imbibe (uptake) water more quickly than corn seeds and while we hear 48 hours to be on the safe side, the critical period is more like 24 hours. Also, several years of both small plot and on-farm research in Nebraska has shown the primary way to increase soybean yields is to plant early. Dr. Jim Specht’s research showed soybeans produced a new node every 3.75 days once V1 occurs. The nodes are where pods and seed occur. Our on-farm research planting date studies also showed regardless if the spring was cold/wet or warm/dry, the early planted soybean always out-yielded the later planted with a total average across trials of 3 bu/ac. The data ranged from 1-10 bu/ac. We never planted early without using an insecticide/fungicide seed treatment to protect that seed, so we recommend you add that if you do plant early. Our recommendation would be to plant the last week of April or as close to May 1 as conditions allow. We’ve also seen good results after April 20 in years if the soil temperatures were around 50F with good weather conditions at least 24-48 hours after planting to maintain that soil temp. It’s important to know your level of risk, though. Crop Insurance planting date for replant considerations is April 25 and there may also be replant options from your seed suppliers. We never replanted any of our studies and I have only observed frost on soybean cotyledons one year where growers planted early with soybeans coming out of it. We had the largest number of acres I’ve seen planted by April 24 last year with thankfully no issues and they were able to take advantage of a high-yielding bean year. Perhaps this is something you wish to try for yourself this year? Consider planting some passes of soybeans early and come back with some passes three weeks later. You can use this Soybean Planting Date Protocol if you’re interested in trying this for yourself. Please let me know if you’re interested in this! Depending on the number of acres you have, some growers are now planting soybeans first. Others are planting corn and soybeans at the same time by either running two of their own planters/drills or custom hiring someone to plant soybeans for them. This also spreads risk and can help with harvest. Regarding maturities, a study conducted at UNL East Campus compared a 2.1 vs. 3.0 maturity group variety at 10 day intervals beginning April 23 through June 19. Yield was highest for early planted soybean and a yield penalty of 1/8 to 1/4 bu/ac per day of delay in planting for MG2.1 and MG3.0 varieties, respectively was found. The study also indicated that yield of the MG3.0 variety was higher relative to the MG2.1 variety in early plantings (late April and early-mid May), but the opposite (greater yield in MG2.1 versus MG3.0 variety) was found for late plantings (late-May and June). In our part of the State, we’ve observed really high yields from strong genetics in the MG2.4-2.5 varieties when planted early; so I have a hard time automatically recommending later MG varieties without more data. Thus, I would love to work with anyone interested in planting early comparing a high yielding MG2.4-2.5 vs. a high yielding MG3.0-3.5 to obtain more data. Here’s a Soybean Maturity Group Comparison with Early Planting protocol to consider and please let me know if you’re interested in this! Nebraska crop reporting districts for wheat. The yellow area is considered ‘Eastern Nebraska’. sharing wheat information for Eastern Nebraska. He’s put together an excellent resource on his blog at http://croptechcafe.org/winterwheat/. Every Friday he’s sharing an update called “What’s up this Wheat“. He also started an Eastern NE wheat listserv and his website explains how to subscribe to it. Grateful for his effort in this as we both have goals of increasing crop diversity in the areas we serve and there are many benefits to wheat in rotation! Crabgrass prevention in Lawns: Just a quick note that while our Extension lawn calendars promote applying crabgrass preventer in mid-April, our horticulture experts say to wait till soil temperatures are 55F on a seven day average and we are currently far from that! Check out https://cropwatch.unl.edu/cropwatchsoiltemperature for soil temp info. The current Drought Monitor shows 19% of Nebraska in the “abnormally dry” or “moderate drought” categories and in the shadow of large-scale drought in Kansas (97%) and Colorado (88%). Being curious about beginning soil moisture in non-irrigated situations, I installed Watermark soil moisture sensors in six non-irrigated, no-till locations in Webster, Nuckolls, Thayer, and Clay counties. Nebraska map showing moderate drought (tan) and abnormally dry (yellow) areas of the state with locations of soil water sensors indicated by red stars. 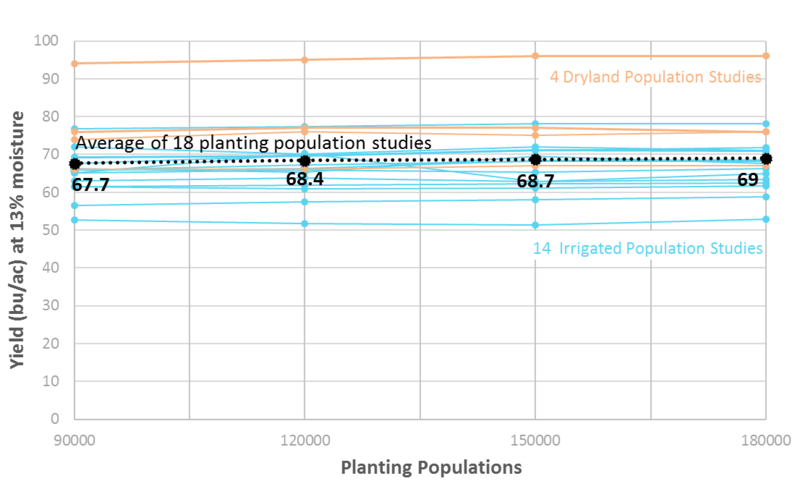 This quantitative information can be helpful as growers make planning and planting decisions. Granted, most planting decisions have already been made with inputs already purchased. Spring rains are also typically expected. However, information like this can help a grower be flexible in that planning should anticipated rains not be timely. The grower may choose to plant a more drought-tolerant crop like sorghum or a more drought-tolerant corn hybrid. A grower with livestock may choose to plant a feed/forage crop. A grower may choose to not terminate a growing cover crop such as rye, instead growing it for feed. Soil moisture sensors were installed at 1-, 2-, 3-, and 4-foot depths in non-irrigated, no-till corn and soybean residue fields near Byron, Superior, Lawrence, Bladen, and Clay Center. The sensors were connected to Watermark dataloggers from the Irrometer company. Because the default soil temperature on the dataloggers is 70°F, a temperature sensor is also installed to ensure correct calibration of the soil moisture. This is because soil temperature during this time is dfferent (much lower) than 70°F. Any farmer or crop consultant could do the same for his/her fields to determine the same information and wouldn’t need the datalogger. Taking weekly readings at the same time each week, or even daily at the same time, would also give one an idea of beginning soil moisture. It’s best to allow at least 48-72 hours for the sensors to equilibrate to the current soil moisture conditions. This process is essentially the same as when sensors are installed for irrigation scheduling. The difference is these are non-irrigated fields with no current crop growing. For additional information and videos on using watermark sensors, please see the Nebraska Agricultural Water Management Network website. Nuckolls County is shown as in “moderate drought” on the Drought Monitor. At the Superior location, we were hoping to also install into actively growing rye and winter-killed forage to determine beginning soil moisture in those conditions. The rye is currently 6 inches tall in the tillering stage and the soil probe wouldn’t go in the ground beyond 6 inches, so no moisture sensors were installed. The soil probe would only go in 12 inches in the winter-killed forage consisting of sorghum-sudan and radishes; thus, soil moisture sensors weren’t installed in that field either. During installation, the 3- and 4-foot depths at all locations (only 4-foot at Clay Center) seemed very dry. The soybean residue appeared drier than corn residue. Two sites are located near Lawrence, one in corn residue and one in soybean residue across the road from each other. That data shows differences in moisture between different residue types the most clearly. I was unable to install to the 4-foot depth at the Lawrence soybean residue location. At most other sites, a hammer was used to help install to 4 feet. However, given the difficulty in installing the 4-foot sensor, these graphs do not show them as dry or drier than the 3-foot at any location other than Bladen. The soil textural properties at 4-foot depth could have more clay and higher soil bulk density in which the drier conditions would not be obvious or easily determined just by installation difficulty. There could be a compacted layer. The dryness or wetness of any given soil layer at any given time is a function of various factors including the farming history of the field, previous several years of root development in different layers, previous year’s precipitation amount and distribution during the season as well as during off-season, evaporation rate, and water uptake pattern of the crop from different soil layers as water update from different soil layers varies and also varies with time during the season. The 4-foot layer may not actually be drier than the 3-foot layer. Because only a few days of data are shown thus far, it is difficult to make a determination at this time. Data will continue to be collected until each field is planted and the results will be posted weekly on my blog. Additional information regarding each location is in each figure caption. A special thank you to each farmer cooperating with me on this effort and to Dr. Suat Irmak for providing additional equipment and advice on this effort. Soil moisture for top four feet in non-irrigated, no-till corn stubble near Bladen. Total soil moisture is currently depleted above 50% at this location. Notice even the second foot is above 50% depletion. The third and fourth foot follow the same line. Soil moisture for top four feet in non-irrigated, no-till soybean stubble near Byron. Total soil moisture is currently depleted around 42% at this location. The second foot is also approaching 50% depletion at this site. Soil moisture for top four feet in non-irrigated, no-till corn stubble near Clay Center. Total soil moisture is currently depleted around 30% for this location. Soil moisture for top four feet in non-irrigated, no-till corn stubble near Superior. Total soil moisture is currently depleted around 30% for this location. Soil moisture for top four feet in non-irrigated, no-till corn stubble near Lawrence. Total soil moisture is currently depleted around 37% for this location. Soil moisture for top three feet in non-irrigated, no-till soybean stubble near Lawrence. Total moisture in these three feet is currently depleted around 37% for this location. Only three feet were installed as I didn’t have a drill to install the fourth foot. Hope you had a blessed Easter! The Wheat Stem Maggot in Cover Crop Webinar can now be viewed at: https://www.youtube.com/watch?v=XGjuzMlrjhQ&feature=youtu.be. The link for the survey mentioned in the webinar is no longer available but you are welcome to contact Dr. Justin McMechan for additional comments/questions. He goes through a number of insects to watch for and his ultimate message is to scout to determine termination timing. Cover Crop Interseeding: A few weeks ago I attended the interseeding cover crops field day which had a really good attendance for March! For those of you considering this, I learned it’s best to start earlier than V6…consider V3 and if it’s wet, you have a better chance of actually getting interseeding accomplished by V6. This is year 3 of their study. The first year they used a spreader to seed the mixes. The second year they found utilizing insecticide boxes for the seeding when they cultivated worked the best. The third year they used a Hiniker inter-row seeder which they purchased. Regarding mixes, most of them included annual ryegrass or cereal rye. There’s a Penn State mix (27# total of annual ryegrass, red clover, and hairy vetch) that has been successful in northern U.S. states. Very little cover was observable this spring, but from a photo provided, it appeared growth came on during corn senescence and after harvest last year. Fall biomass wasn’t measured last year which will hopefully be measured in the future to obtain more data on the success of the mixes. My take, if your goal is early spring grazing or early spring cover, I’m unsure that much can beat cereal rye, even if it was dormant seeded. If you’re looking for a way to get some cover established prior to corn harvest for either fall grazing or just fall soil cover, interseeding with a mix containing the annual ryegrass looked good from the pictures they showed. If you’re interested in any cover crop or other on-farm research studies this year, please let me know! Tree Care Workshop: Trees are very valuable in our landscapes. They provide us with beauty, shade, oxygen, and better resale on our homes. These trees need our help to ensure they have healthy growth. When they have a disease or insect problem, it is up to us to manage those pests to help them live many years. On Wednesday, April 18th from 5:30-7 p.m. at the Fairgrounds in Clay Center, Nicole Stoner will teach us what to do with our trees. Nicole is a Horticulture Educator from Gage County. This tree program is $5.00 and will cover light refreshments and your educational materials. Nicole will cover watering, insect and disease problems, general care, and planting of trees. Please pre-register by April 13th with Nebraska Extension in Clay County by calling 402-762-3644 or emailing dpeshek2@unl.edu. Admission to the sale is free. The plant sale, presentations, educational booths and vendors of garden-related items are all in Pavilion I of the Lancaster Event Center with plenty of free parking. For more information, visit https://plantnebraska.org/spring-affair. DriftWatch/BeeCheck: Nebraska Department of Ag (NDA) encourages pesticide applicators to check out DriftWatch/BeeCheck at http://driftwatch.org to minimize pesticide drift. It’s important for those with sensitive sites such as organic, bees, vegetables, grapes, etc. to add them to this website and important for all applicators to check this website for sensitive locations around our fields. Several states have been added to DriftWatch/BeeCheck in the last year and a few more are in the works, making it more beneficial to applicators working near the state line or those working in multiple states. FieldWatch, the company that manages DriftWatch/BeeCheck, now offers data subscriptions for obtaining data files for GIS maps or live stream data through several mapping software providers. It will be rolling out a new mobile app very soon, FieldCheck, for applicators who have registered as an applicator (which is free to do). You can also view the most recent edition of NDA’s Plant Health Protection Update at: https://us14.campaign-archive.com/home/?u=eb13611bfcca17410ce5c5f52&id=10756f8d33.